Abstract: Long-acting muscarinic antagonists (LAMAs), along with long-acting β2-agonists (LABAs), are the mainstay for treatment of patients with COPD. Glycopyrrolate, or glycopyrronium bromide, like other LAMAs, inhibits parasympathetic nerve impulses by selectively blocking the binding of acetylcholine to muscarinic receptors. Glycopyrrolate is unusual in that it preferentially binds to M3 over M2 muscarinic receptors, thereby specifically targeting the primary muscarinic receptor responsible for bronchoconstriction occurring in COPD. Inhaled glycopyrrolate is slowly absorbed from the lungs and rapidly eliminated from the bloodstream, most likely by renal excretion in its unmetabolized form, limiting the potential for systemic adverse events. Inhaled glycopyrrolate is a fast-acting, efficacious treatment option for patients with moderate–severe COPD. It improves lung function, reduces the risk of exacerbations, and alleviates the symptoms of breathlessness, which in turn may explain the improvement seen in patients’ quality of life. Inhaled formulations containing glycopyrrolate are well tolerated, and despite being an anticholinergic, few cardiovascular-related events have been reported. Inhaled glycopyrrolate is thus of value as both monotherapy and in combination with other classes of medication for maintenance treatment of COPD. This review covers the mechanism of action of inhaled glycopyrrolate, including its pharmacokinetic, pharmacodynamic, and safety profiles, and effects on mucus secretion. It also discusses the use of inhaled glycopyrrolate in the treatment of COPD, as monotherapy and in fixed-dose combinations with LABAs and inhaled corticosteroid–LABAs, including a triple therapy recently approved in Europe. Patients with COPD have narrowed airways and cannot fully empty their lungs, which together can make breathing uncomfortable. Doctors often prescribe an inhaler containing drugs that widen the airways or reduce inflammation in the lungs, making it easier for patients with COPD to breathe. Patients who do not show enough benefit from treatment with one drug alone may be given two or more drugs, which can be combined into one inhaler. One drug used to widen the airways in patients with COPD is glycopyrrolate (also referred to as glycopyrronium bromide). Glycopyrrolate can be used to treat COPD on its own, as well as in combination with other drugs. In this article, we discuss the evidence for how glycopyrrolate works in the body, how glycopyrrolate enters and leaves the body, and the effectiveness and side effects of glycopyrrolate when used to treat patients with COPD in clinical trials alone and combined in one inhaler with another airway-widening drug with or without a drug used to reduce inflammation in the lungs. 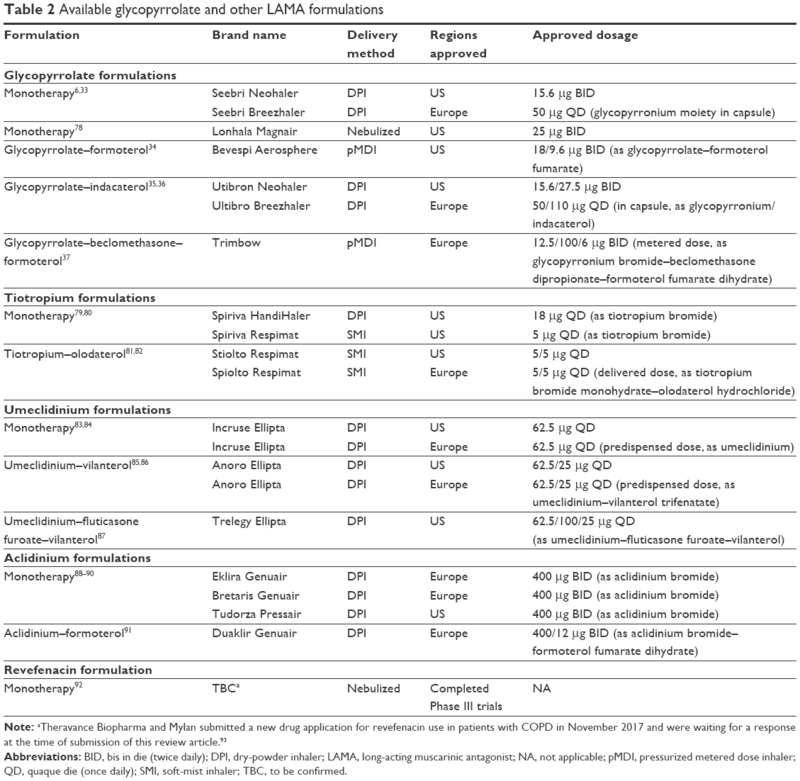 Long-acting muscarinic antagonists (LAMAs) or long-acting β2-agonists (LABAs), alone or in combination, are the mainstay for the maintenance treatment of patients with COPD.1,2 In the 1980s, inhaled glycopyrrolate, also known as glycopyrronium bromide, was found to be a long-acting bronchodilator3,4 and improved pulmonary function after exercise in patients with asthma,5 although inhaled glycopyrrolate is not currently licensed for use in asthma.6 Inhaled glycopyrrolate, a rapid-onset LAMA, is now US Food and Drug Administration (FDA)- and European Medicines Agency (EMA)-approved for maintenance treatment of patients with COPD.1,6,7 This review covers the mechanism of action of inhaled glycopyrrolate, its pharmacokinetic (PK) and pharmacodynamic (PD) profiles, safety profile, effects on mucus secretion, and use in the treatment of COPD as monotherapy and in fixed-dose combinations (FDCs) with LABAs and inhaled corticosteroid (ICS)–LABAs. Figure 1 Role of ACh and muscarinic receptors in the lung. Notes: Data from these studies.11,17 In large airways, ACh released from cholinergic nerves activates M3 receptors on ASM, causing bronchoconstriction. In peripheral airways, where cholinergic nerves are absent, inflammatory cells stimulate epithelial cells to release ACh, activating M3 receptors on ASM and causing bronchoconstriction. M3 muscarinic receptors are shown as solid blue circles. For simplicity, other types of muscarinic receptor are not shown. Abbreviations: ACh, acetylcholine; ASM, airway smooth muscle; CNS, central nervous system. Notes: aP<0.05 vs both aclidinium and tiotropium at equal concentrations. “–” indicates data not available. Abbreviations: ED50, dose required to inhibit salivation in 50% of rats; Ki, antagonist dissociation constant; LAMAs, long-acting muscarinic antagonists; SE, standard error; SEM, standard error of the mean; t½, half-life. Oral glycopyrrolate is known to reduce drooling in children, and glycopyrrolate injections can reduce preoperative salivation, as well as respiratory secretions during end-of-life care.30,31 However, on review of published literature cited in PubMed, no studies could be found that examined the role of inhaled glycopyrrolate in mucus secretion. There also appear to be limited published data examining the effect of glycopyrrolate on mucociliary clearance,25 and hence, there is a need for further study in this area. Glycopyrrolate is a water-soluble, highly polar quaternary ammonium compound, which limits its passage across lipid membranes such as the blood–brain barrier; therefore, glycopyrrolate does not exhibit any central nervous system activity.32 Inhaled glycopyrrolate is thus unlikely to have a significant effect on cognition in patients with COPD, although there is a lack of evidence to support this. Abbreviations: BID, bis in die (twice daily); DPI, dry-powder inhaler; LAMA, long-acting muscarinic antagonist; NA, not applicable; pMDI, pressurized metered dose inhaler; QD, quaque die (once daily); SMI, soft-mist inhaler; TBC, to be confirmed. Notes: aPhase II studies included, as Phase III trial data have not yet been published for this product; beach patient received three treatments of two doses of glycopyrrolate and either placebo or ipratropium. Abbreviations: AUC, area under curve; BID, bis in die (twice daily); FEV1, forced expiratory volume in 1 second; FVC, forced vital capacity; LSM, least squares mean; NS, not significant; QD, quaque die (once daily); QID, quater in die (four times daily); SGRQ, St George’s Respiratory Questionnaire; TDI, Transition Dyspnea Index. Note: aGOLD B and D defined according to the 2013 GOLD guidelines (FAVOR), the 2010 GOLD guidelines (ILLUMINATE), or the 2009 GOLD guidelines (LANTERN). Abbreviations: AUC, area under curve; BID, bis in die (twice daily); DPI, dry-powder inhaler; FDC, fixed-dose combination; FEV1, forced expiratory volume in 1 second; FVC, forced vital capacity; GOLD, Global Initiative for Chronic Obstructive Pulmonary Disease; LSM, least squares mean; IC, inspiratory capacity; ICS-LABA, inhaled corticosteroid-long-acting β2-agonist; NS, not significant; pMDI, pressurized metered-dose inhaler; QD, quaque die (once daily); SGRQ, St George’s Respiratory Questionnaire; TDI, Transition Dyspnea Index. Inhaled glycopyrrolate is a fast-acting, efficacious treatment option for patients with moderate–severe COPD and is available in a variety of doses. It improves lung function, reduces the risk of exacerbations, and alleviates the symptoms of breathlessness, which in turn may explain the improvement seen in patients’ QoL. Glycopyrrolate has comparable effects on lung function to tiotropium, and glycopyrrolate and aclidinium showed more rapid onset of action than tiotropium. Formulations containing inhaled glycopyrrolate are well tolerated and, despite being an anticholinergic, few CV-related events have been reported, with glycopyrrolate showing a similar safety profile to tiotropium. Inhaled glycopyrrolate is thus of value both as monotherapy and for optimizing bronchodilation when used in FDCs with LABAs and ICS–LABAs for maintenance treatment of COPD. We thank Johan Karlberg, MD, PhD, of the Clinical Trial Magnifier Newsletter for some of the information in this manuscript. Medical writing support was provided by Carly Hayes, PhD, of Core (London, UK) and editorial support was provided by Maryam Vahdat, PGDip of Core (London, UK), which was in accordance with Good Publication Practice (GPP3) guidelines and funded by AstraZeneca LP (Wilmington, DE, USA). AstraZeneca LP reviewed the manuscript for medical accuracy prior to submission. DPT and NJG made substantial contributions to the conception of this article, drafted, and critically revised it for important intellectual content; provided final approval of the version to be published; and agreed to be accountable for all aspects of the work in ensuring that questions related to the accuracy or integrity of the work are appropriately investigated and resolved. DPT serves on advisory boards for AstraZeneca, Sunovion, Mylan, and Theravance/Innoviva, and as a speaker for AstraZeneca, Boehringer-Ingelheim, and Sunovion. NJG has no conflicts of interest. Global Initiative for Chronic Obstructive Lung Disease (GOLD). Global Strategy for the Diagnosis, Management and Prevention of Chronic Obstructive Pulmonary Disease. Bethesda, MD: GOLD; 2017. Qaseem A, Wilt TJ, Weinberger SE, et al. Diagnosis and management of stable chronic obstructive pulmonary disease: a clinical practice guideline update from the American College of Physicians, American College of Chest Physicians, American Thoracic Society, and European Respiratory Society. Ann Intern Med. 2011;155(3):179–191. Schroeckenstein DC, Bush RK, Chervinsky P, Busse WW. Twelve-hour bronchodilation in asthma with a single aerosol dose of the anticholinergic compound glycopyrrolate. J Allergy Clin Immunol. 1988;82(1):115–119. Walker FB, Kaiser DL, Kowal MB, Suratt PM. Prolonged effect of inhaled glycopyrrolate in asthma. Chest. 1987;91(1):49–51. Johnson BE, Suratt PM, Gal TJ, Wilhoit SC. Effect of inhaled glycopyrrolate and atropine in asthma: precipitated by exercise and cold air inhalation. Chest. 1984;85(3):325–328. US Food and Drug Administration. Seebri Neohaler [prescribing Information]. 2015. Available from: https://www.accessdata.fda.gov/drugsatfda_docs/label/2015/207923lbl.pdf. Accessed March 20, 2018. European Medicines Agency. European public assessment report: Seebri Breezhaler. 2012. Available from: http://www.ema.europa.eu/docs/en_GB/document_library/EPAR_-_Public_assessment_report/human/002430/WC500133771.pdf. Accessed March 20, 2018. Cazzola M, Page CP, Calzetta L, Matera MG. Pharmacology and therapeutics of bronchodilators. Pharmacol Rev. 2012;64(3):450–504. Racké K, Matthiesen S. The airway cholinergic system: physiology and pharmacology. Pulm Pharmacol Ther. 2004;17(4):181–198. Franko BV, Lunsford CD. Derivatives of 3-pyrrolidinols – III: the chemistry, pharmacology, and toxicology of some N-substituted-3-pyrrolidyl α-substituted phenylacetates. J Med Pharm Chem. 1960;2:523–540. Barnes PJ. Anticholinergics. In: Celli BR, editor. Pharmacotherapy in Chronic Obstructive Pulmonary Disease. New York: Marcel Dekker; 2004:201–216. Bartels C, Looby M, Sechaud R, Kaiser G. Determination of the pharmacokinetics of glycopyrronium in the lung using a population pharmacokinetic modelling approach. Br J Clin Pharmacol. 2013;76(6):868–879. Sykes DA, Dowling MR, Leighton-Davies J, et al. The influence of receptor kinetics on the onset and duration of action and the therapeutic index of NVA237 and tiotropium. J Pharmacol Exp Ther. 2012;343(2):520–528. Kaltiala E, Penttilä A, Vapaatalo H, Larmi T. The fate of intravenous (3H)glycopyrrolate in man. J Pharm Pharmacol. 1974;26(5):352–354. Sechaud R, Renard D, Zhang-Auberson L, de la Motte S, Drollmann A, Kaiser G. Pharmacokinetics of multiple inhaled NVA237 doses in patients with chronic obstructive pulmonary disease (COPD). Int J Clin Pharmacol Ther. 2012;50(2):118–128. Gavaldà A, Ramos I, Carcasona C, et al. The in vitro and in vivo profile of aclidinium bromide in comparison with glycopyrronium bromide. Pulm Pharmacol Ther. 2014;28(2):114–121. Hansel TT, Barnes PJ. Tiotropium bromide: a novel once-daily anticholinergic bronchodilator for the treatment of COPD. Drugs Today (Barc). 2002;38(9):585–600. Ogoda M, Niiya R, Koshika T, Yamada S. Comparative characterization of lung muscarinic receptor binding after intratracheal administration of tiotropium, ipratropium, and glycopyrrolate. J Pharmacol Sci. 2011;115(3):374–382. Rogliani P, Calzetta L, Ora J, et al. Pharmacological assessment of the onset of action of aclidinium and glycopyrronium versus tiotropium in COPD patients and human isolated bronchi. Eur J Pharmacol. 2015;761:383–390. Sentellas S, Ramos I, Alberti J, et al. Aclidinium bromide, a new, long-acting, inhaled muscarinic antagonist: in vitro plasma inactivation and pharmacological activity of its main metabolites. Eur J Pharm Sci. 2010;39(5):283–290. 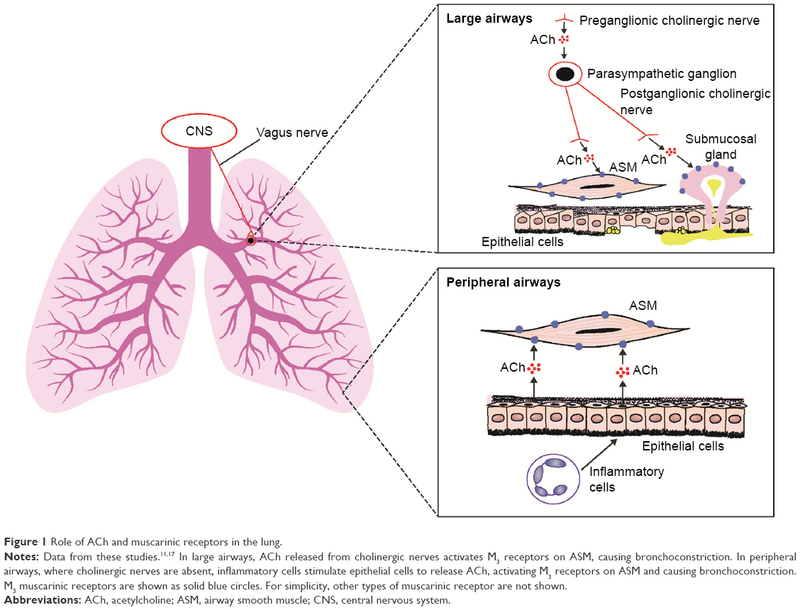 Ramos FL, Krahnke JS, Kim V. Clinical issues of mucus accumulation in COPD. Int J Chron Obstruct Pulmon Dis. 2014;9:139–150. Melloni B, Germouty J. [The influence of a new β-agonist: formoterol on mucociliary function]. Rev Mal Respir. 1992;9(5):503–507. French. Lindberg S, Khan R, Runer T. The effects of formoterol, a long-acting β2-adrenoceptor agonist, on mucociliary activity. Eur J Pharmacol. 1995;285(3):275–280. Restrepo RD. Inhaled adrenergics and anticholinergics in obstructive lung disease: do they enhance mucociliary clearance? Respir Care. 2007;52(9):1159–1173. Tagaya E, Yagi O, Sato A, et al. Effect of tiotropium on mucus hypersecretion and airway clearance in patients with COPD. Pulm Pharmacol Ther. 2016;39:81–84. Hasani A, Toms N, Agnew JE, Sarno M, Harrison AJ, Dilworth P. The effect of inhaled tiotropium bromide on lung mucociliary clearance in patients with COPD. Chest. 2004;125(5):1726–1734. Meyer T, Reitmeir P, Brand P, et al. Effects of formoterol and tiotropium bromide on mucus clearance in patients with COPD. Respir Med. 2011;105(6):900–906. Bennett WD, Chapman WF, Mascarella JM. The acute effect of ipratropium bromide bronchodilator therapy on cough clearance in COPD. Chest. 1993;103(2):488–495. 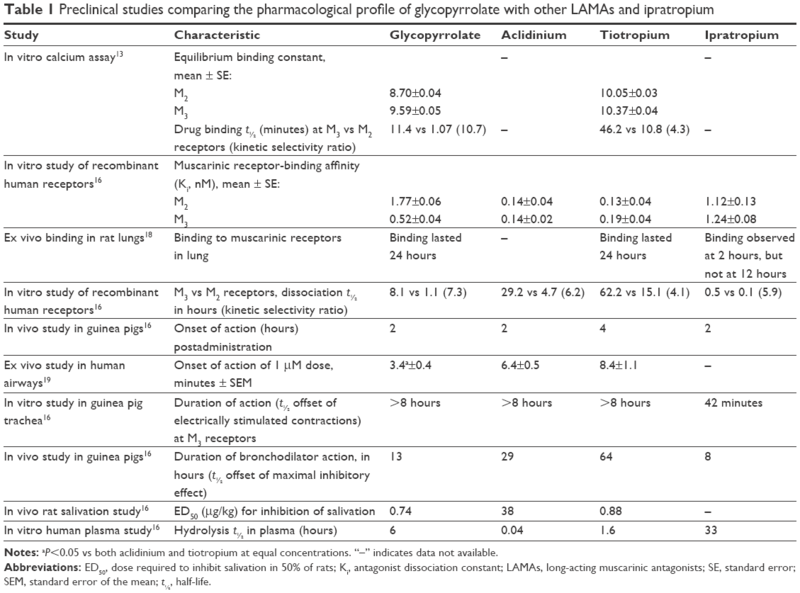 Hugel H, Ellershaw J, Gambles M. Respiratory tract secretions in the dying patient: a comparison between glycopyrronium and hyoscine hydrobromide. J Palliat Med. 2006;9(2):279–284. US Food and Drug Administration. Medical review: glycopyrrolate. 2009. Available from: https://www.accessdata.fda.gov/drugsatfda_docs/nda/2010/022571Orig1s000MedR.pdf. Accessed March 20, 2018. Mirakhur RK, Dundee JW, Jones CJ. Evaluation of the anticholinergic actions of glycopyrronium bromide. Br J Clin Pharmacol. 1978;5(1):77–84. European Medicines Agency. Seebri Breezhaler [summary of product characteristics]. 2012. Available from: https://www.medicines.org.uk/emc/medicine/27138. Accessed March 20, 2018. AstraZeneca Pharmaceuticals LP. Bevespi Aerosphere [prescribing information]. 2016. Available from: https://www.azpicentral.com/bevespi/bevespi_pi.pdf. Accessed March 20, 2018. European Medicines Agency. Ultibro Breezhaler [summary of product characteristics]. 2016. Available from: https://www.medicines.org.uk/emc/medicine/29533. Accessed March 20, 2018. US Food and Drug Administration. Utibron Neohaler [prescribing information]. 2017. Available from: https://www.accessdata.fda.gov/drugsatfda_docs/label/2015/207930s000lbl.pdf. Accessed March 20, 2018. European Medicines Agency. Trimbow [summary of product characteristics]. 2017. Available from: http://www.ema.europa.eu/docs/en_GB/document_library/EPAR_-_Product_Information/human/004257/WC500233163.pdf. Accessed March 20, 2018. Kerwin E, Donohue JF, Goodin T, Tosiello R, Wheeler A, Ferguson GT. Efficacy and safety of glycopyrrolate/eFlow CS (nebulized glycopyrrolate) in moderate-to-very-severe COPD: Results from the glycopyrrolate for obstructive lung disease via electronic nebulizer (GOLDEN) 3 and 4 randomized controlled trials. Respir Med. 2017;132:238–250. European Medicines Agency. Trimbow [initial authorization]. 2017. Available from: http://www.ema.europa.eu/docs/en_GB/document_library/Summary_of_opinion_-_Initial_authorisation/human/004257/WC500228080.pdf. Accessed March 20, 2018. Arievich H, Overend T, Renard D, et al. A novel model-based approach for dose determination of glycopyrronium bromide in COPD. BMC Pulm Med. 2012;12:74. D’Urzo A, Ferguson GT, van Noord JA, et al. Efficacy and safety of once-daily NVA237 in patients with moderate-to-severe COPD: the GLOW1 trial. Respir Res. 2011;12:156. Kerwin E, Hébert J, Gallagher N, et al. Efficacy and safety of NVA237 versus placebo and tiotropium in patients with COPD: the GLOW2 study. Eur Respir J. 2012;40(5):1106–1114. Beeh KM, Singh D, Di Scala L, Drollmann A. Once-daily NVA237 improves exercise tolerance from the first dose in patients with COPD: the GLOW3 trial. Int J Chron Obstruct Pulmon Dis. 2012;7:503–513. Sekiya M, Kawayama T, Fukuchi Y, et al. Safety and efficacy of NVA237 once daily in Japanese patients: the GLOW4 trial. Eur Respir J. 2012;40 (Suppl 56):P2013. Wang C, Sun T, Huang Y, et al. Efficacy and safety of once-daily glycopyrronium in predominantly Chinese patients with moderate-to-severe chronic obstructive pulmonary disease: the GLOW7 study. Int J Chron Obstruct Pulmon Dis. 2015;10:57–68. LaForce C, Feldman G, Spangenthal S, et al. Efficacy and safety of twice-daily glycopyrrolate in patients with stable, symptomatic COPD with moderate-to-severe airflow limitation: the GEM1 study. Int J Chron Obstruct Pulmon Dis. 2016;11:1233–1243. Kerwin E, Siler TM, Korenblat P, et al. Efficacy and safety of twice-daily glycopyrrolate versus placebo in patients with COPD: the GEM2 study. Chronic Obstr Pulm Dis. 2016;3(2):549–559. Mahler DA, Gifford AH, Satti A, et al. Long-term safety of glycopyrrolate: a randomized study in patients with moderate-to-severe COPD (GEM3). Respir Med. 2016;115:39–45. Ferguson GT, Goodin T, Tosiello R, Wheeler A, Kerwin E. Long-term safety of glycopyrrolate/eFlow CS in moderate-to-very-severe COPD: results from the Glycopyrrolate for Obstructive Lung Disease via Electronic Nebulizer (GOLDEN) 5 randomized study. Respir Med. 2017;132:251–260. Fabbri LM, Kerwin EM, Spangenthal S, et al. Dose-response to inhaled glycopyrrolate delivered with a novel Co-Suspension Delivery Technology metered dose inhaler (MDI) in patients with moderate-to-severe COPD. Respir Res. 2016;17(1):109. Karabis A, Lindner L, Mocarski M, Huisman E, Greening A. Comparative efficacy of aclidinium versus glycopyrronium and tiotropium, as maintenance treatment of moderate to severe COPD patients: a systematic review and network meta-analysis. Int J Chron Obstruct Pulmon Dis. 2013;8:405–423. Ismaila AS, Huisman EL, Punekar YS, Karabis A. Comparative efficacy of long-acting muscarinic antagonist monotherapies in COPD: a systematic review and network meta-analysis. Int J Chron Obstruct Pulmon Dis. 2015;10:2495–2517. Lechuga-Ballesteros D, Noga B, Vehring R, Cummings RH, Dwivedi SK. Novel cosuspension metered-dose inhalers for the combination therapy of chronic obstructive pulmonary disease and asthma. Future Med Chem. 2011;3(13):1703–1718. Vehring R, Lechuga-Ballesteros D, Joshi V, Noga B, Dwivedi SK. Cosuspensions of microcrystals and engineered microparticles for uniform and efficient delivery of respiratory therapeutics from pressurized metered dose inhalers. Langmuir. 2012;28(42):15015–15023. Kerwin EM, Spangenthal S, Kollar C, St Rose E, Reisner C. A phase IIB randomized, chronic-dosing, incomplete block, cross-over study of glycopyrronium, delivered via metered dose inhaler, compared with a placebo and an active control in patients with moderate-to-severe COPD. Respir Res. 2018;19(1):38. Cazzola M, Matera MG. The effective treatment of COPD: anticholinergics and what else? Drug Discov Today Ther Strateg. 2006;3(3):277–286. Barisione G, Baroffio M, Crimi E, Brusasco V. Beta-adrenergic agonists. Pharmaceuticals (Basel). 2010;3(4):1016–1044. Martinez FJ, Rabe KF, Ferguson GT, et al. Efficacy and safety of glycopyrrolate/formoterol metered dose inhaler formulated using Co-Suspension Delivery Technology in patients with COPD. Chest. 2017;151(2):340–357. Hanania NA, Tashkin DP, Kerwin EM, et al. Long-term safety and efficacy of glycopyrrolate/formoterol metered dose inhaler using novel Co-Suspension Delivery Technology in patients with chronic obstructive pulmonary disease. Respir Med. 2017;126:105–115. Reisner C, Gottschlich G, Fakih F, et al. 24-h bronchodilation and inspiratory capacity improvements with glycopyrrolate/formoterol fumarate via co-suspension delivery technology in COPD. Respir Res. 2017;18:157. Martinez FJ, Fabbri LM, Ferguson GT, et al. Baseline symptom score impact on benefits of glycopyrrolate/formoterol metered dose inhaler in COPD. Chest. 2017;152(6):1169–1178. Kardos P, Hagedorn-Peinz I. The impact of indacaterol/glycopyrronium fixed-dose combination versus tiotropium monotherapy on lung function and treatment preference: a randomized crossover study: the FAVOR study. Int J Chron Obstruct Pulmon Dis. 2018;13:69–77. Zhong N, Wang C, Zhou X, et al. LANTERN: a randomized study of QVA149 versus salmeterol/fluticasone combination in patients with COPD. Int J Chron Obstruct Pulmon Dis. 2015;10:1015–1026. Ferguson GT, Taylor AF, Thach C, et al. Long-term maintenance bronchodilation with indacaterol/glycopyrrolate versus indacaterol in moderate-to-severe COPD patients: the FLIGHT 3 study. Chronic Obstr Pulm Dis. 2016;3(4):716–728. Kerwin E, Ferguson GT, Sanjar S, et al. Dual bronchodilation with indacaterol maleate/glycopyrronium bromide compared with umeclidinium bromide/vilanterol in patients with moderate-to-severe COPD: results from two randomized, controlled, cross-over studies. Lung. 2017;195(6):739–747. Vogelmeier C, Zhong N, Humphries MJ, et al. Indacaterol/glycopyrronium in symptomatic patients with COPD (GOLD B and GOLD D) versus salmeterol/fluticasone: ILLUMINATE/LANTERN pooled analysis. Int J Chron Obstruct Pulmon Dis. 2016;11:3189–3197. Watz H, Mailänder C, Baier M, Kirsten A. Effects of indacaterol/glycopyrronium (QVA149) on lung hyperinflation and physical activity in patients with moderate to severe COPD: a randomised, placebo-controlled, crossover study (the MOVE study). BMC Pulm Med. 2016;16(1):95. Frith PA, Thompson PJ, Ratnavadivel R, et al. Glycopyrronium once-daily significantly improves lung function and health status when combined with salmeterol/fluticasone in patients with COPD: the GLISTEN study, a randomised controlled trial. Thorax. 2015;70(6):519–527. US Food and Drug Administration. Lonhala Magnair [prescribing information]. 2017. Available from: https://www.accessdata.fda.gov/drugsatfda_docs/label/2017/208437lbl.pdf. Accessed March 20, 2018. Boehringer Ingelheim. Spiriva HandiHaler [prescribing information]. 2016; Available from: http://docs.boehringer-ingelheim.com/Prescribing%20Information/PIs/Spiriva/Spiriva.pdf. Accessed March 20, 2018. Boehringer Ingelheim. Spiriva Respimat [prescribing information]. 2017. Available from: http://docs.boehringer-ingelheim.com/Prescribing%20Information/PIs/Spiriva%20Respimat/spirivarespimat.pdf. Accessed March 20, 2018. Boehringer Ingelheim. Stiolto Respimat [prescribing information]. 2016. Available from: http://docs.boehringer-ingelheim.com/Prescribing%20Information/PIs/Stiolto%20Respimat/stiolto.pdf. Accessed March 20, 2018. European Medicines Agency. Spiolto Respimat [summary of product characteristics]. 2015. Available from: https://www.medicines.org.uk/emc/medicine/30495. Accessed March 20, 2018. European Medicines Agency. Incruse [summary of product characteristics]. 2017. Available from: http://www.ema.europa.eu/docs/en_GB/document_library/EPAR_-_Product_Information/human/002809/WC500167430.pdf. Accessed March 20, 2018. GlaxoSmithKline. Incruse Ellipta [prescribing information]. 2017. Available from: https://www.gsksource.com/pharma/content/dam/GlaxoSmithKline/US/en/Prescribing_Information/Incruse_Ellipta/pdf/INCRUSE-ELLIPTA-PI-PIL.PDF. Accessed March 20, 2018. European Medicines Agency. Anoro [summary of product characteristics]. 2017. Available from: http://www.ema.europa.eu/docs/en_GB/document_library/EPAR_-_Product_Information/human/002751/WC500168424.pdf. Accessed March 20, 2018. GlaxoSmithKline. Anoro Ellipta [prescribing information]. 2013. Available from: https://www.accessdata.fda.gov/drugsatfda_docs/label/2013/203975s000lbl.pdf. Accessed March 20, 2018. GlaxoSmithKline. Trelegy Ellipta [prescribing information]. 2017. Available from: https://www.gsksource.com/pharma/content/dam/GlaxoSmithKline/US/en/Prescribing_Information/Trelegy/pdf/TRELEGY-PI-MG-IFU.PDF. Accessed March 20, 2018. European Medicines Agency. Eklira Genuair [summary of product characteristics]. 2017. Available from: http://www.ema.europa.eu/docs/en_GB/document_library/EPAR_-_Product_Information/human/002211/WC500132661.pdf. Accessed March 20, 2018. AstraZeneca Pharmaceuticals LP. Tudorza Pressair [prescribing information]. 2012. Available from: http://www.azpicentral.com/tudorza/pi_tudorza.pdf. Accessed March 20, 2018. European Medicines Agency. Bretaris Genuair [summary of product characteristics]. 2017. Available from: http://www.ema.europa.eu/docs/en_GB/document_library/EPAR_-_Product_Information/human/002706/WC500132732.pdf. Accessed March 20, 2018. European Medicines Agency. Duaklir Genuair [summary of product characteristics]. 2017. Available from: https://ec.europa.eu/health/documents/community-register/2014/20141119130022/anx_130022_en.pdf. Accessed March 20, 2018. Theravance Biopharma. Revefenacin peak inspiratory flow rate (PIFR) study in COPD. Available from: https://clinicaltrials.gov/ct2/show/NCT03095456. NLM identifier: NCT03095456. Accessed March 20, 2018. Theravance BioPharma. Theravance Biopharma and Mylan submit new drug application to FDA for revefenacin (TD-4208) in adults with chronic obstructive pulmonary disease. 2017. Available from: http://investor.theravance.com/news-releases/news-release-details/theravance-biopharma-and-mylan-submit-new-drug-application-fda. Accessed March 20, 2018.